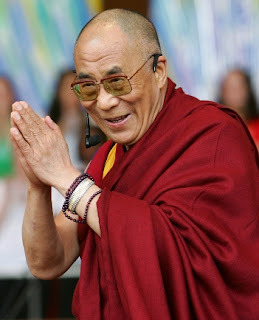 His Holiness the 14th Dalai Lama of Tibet was born in 1935, soon after the 13th Dalai Lama passed away. He was the fourth son of a poor peasant family in Takster village, Amdo province in eastern Tibet. The line of Dalai Lamas, spiritual and temporal rulers of Tibet since the 13th century, is a succession of incarnations. In accordance with tradition, search parties were sent to find the successor to the thirteenth Dalai Lama. Two years later, following the various signs and portents, a government party was led to Takster, where they found the infant Lhamo Thondup. After a series of tests, the child (later named Tenzin Gyatso) was recognized as the 14th incarnation of the Dalai Lama. The Dalai Lama’s education as a Buddhist monk began in earnest when he was six. After eighteen years of intense study, he graduated with the equivalent of a Ph.D in Buddhist metaphysics. In 1958 he took preliminary examinations at each of the three monastic universities. Drepung, Sera and Ganden. The Dalai Lama passed with honour, attaining the highest academic degree of Geshe Lharampa, while under intense political pressure from the Chinese to capitulate to their demands to take over Tibet. A regent was appointed during the Dalai Lama’s minority, but in 1950, at just 16 years old, he was forced to assume full political power. The crisis was precipitated by the Chinese communist invasion. With the Tibetan army no match for the invading forces, the Dalai Lama’s only option was to negotiate. In 1954 he was invited to Beijing where he and his party met Chairman Mao, Chou En Lai and other Chinese leaders intent on convincing them they would be better off under Chinese rule. In 1956 His Holiness visited India, where he met Nehru but won little support for the Tibetan cause. In 1959 the Tibetans rebelled, the Chinese crushed the uprising and the Dalai Lama was forced to flee across the Himalayas to neighbouring India. In India, the Dalai Lama immediately established a democratic government-in-exile dedicated to work for the freedom of Tibet and the welfare of Tibetan refugees. In the last decade, at the invitation of groups and governments, the Dalai Lama has travelled the world, seeking support for the Tibetan cause and sharing his belief in kindness and compassion as the ultimate solution to personal and political conflict.